Iron plays an important role in the body's cellular function. Two-thirds of the iron in the body is used in hemoglobin, the main protein found in red blood cells. Hemoglobin transports oxygen molecules from the lungs to tissues around the body. Insufficient iron can lead to a condition called anemia, which deprives tissues of oxygen. Headaches are one symptom of iron-deficiency anemia. Iron supplements can help treat anemia headaches, but too much iron in the body can also cause headaches. Anemia is a condition caused by a lack of iron in red blood cells. People with anemia may also have a reduced number of blood cells, or small red blood cells. Iron deficiency is a common type of anemia that gradually worsens over time due to an iron-poor diet or chronic, untreated blood loss. People who don’t eat meat or animal products are more likely to develop iron deficiency — these foods are rich in iron. Women who are pregnant or lactating require additional iron, and are prone to a deficiency. Women who regularly have heavy periods also need extra iron. Some medical conditions cause chronic bleeding, such as colorectal cancer and ulcers, while others like Crohn’s disease and stomach bypass surgery, inhibit absorption of iron. Reduced iron in the blood decreases the body’s ability to transport oxygen to tissues that need it. A decrease in the amount of oxygen carried by red blood cells induces a condition in oxygen-deprived tissue called hypoxia. Many of the symptoms of anemia are caused when tissues throughout the body experience hypoxia. Headaches are a common symptom of anemia, because the lack of iron doesn't allow sufficient oxygen to be carried to the brain. Other symptoms related to hypoxia include fatigue, dizziness, rapid heartbeat, shortness of breath, muscle weakness, pale skin, brittle nails and hair loss. Read more: Does Iron Deficiency Cause Headaches? Ferrous sulfate is a common formulation found in iron supplements. These supplements don’t always agree with everyone who takes them, and are known to cause several side effects. Ferrous sulfate side effects include constipation, nausea and a bad or metallic taste in the mouth. Under normal circumstances, headaches are not a side effect of ferrous sulfate supplementation. Because iron deficiency can cause headaches, taking an iron supplement can reduce the incidence of headaches in those with anemia. Read more: What Are the Best Iron Supplements for Women? 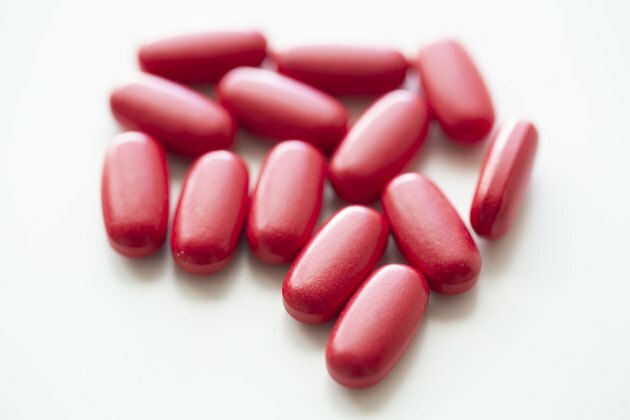 Doctors may prescribe iron supplement infusion for patients who cannot take an oral iron supplement or for a patient who is depleting iron faster than it can be replaced by consuming a tablet or liquid dose. Intravenously administered iron supplements can cause side effects not associated with oral administration. Iron supplement headache is a primary side effect of this form of iron supplementation, and may present immediately or one to two days after the infusion treatment. Other side effects of iron infusion include wheezing, dizziness, flushing, muscle or joint pain, fever and pain at the injection site. The body doesn’t eliminate much iron because it recycles iron from red blood cells no longer in use. Hormones regulate how iron is used in the body and can block its activity if there are adequate iron stores. However, genetic disorders and over-supplementation can cause a buildup of too much iron in the body. Iron overload can result from taking a higher dosage of iron supplement than necessary or taking too much iron supplement when the body does not require it. Headache is one symptom of excess iron in the body. In addition to headache, too much iron in the body affects other aspects of the nervous system and may cause fever, chills, dizziness and convulsions in more severe cases of iron overdose. Individuals who take too much iron can suffer gastrointestinal side effects as well as cardiovascular issues such as a drop in blood pressure and weak, rapid pulse.